For the first time in Latvia! Heidelberg Engineering Retina Tomograph HRT III - new "Golden standard" in diagnostics of glaucoma! For te first time in Latvia! Equipement that created revolution in early (7 years before the disease starts) diagnostics of glaucoma and retinal pathology was installed in our clinics. Dear patients, please remember that early diagnostics and prophylaxis is preventing development of the disease and guarantees maintenance of Your vision. The first in Latvia diode- laser scanning computer system and the leader in the market in the filed of confocal rethinotomography. A qualitative analysis of changes during the post-operative period. Can be combined with a retino-flowmeter Heidelberg. Fundus oculi tomography by laser scanning computer tomography. Unique laser scanning system, intended for qualitative evaluation of spatial geometry form of the central part of fundus oculi. Such measurements are extremely important for early diagnostics of changes in optical nerve region. 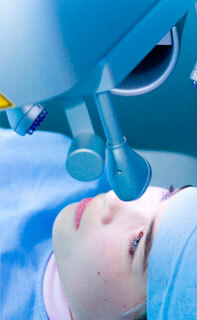 Three dimensional imaging is performed by laser scanning (depth of retinal scanning from 1 to 4 mm). Results are obtained in a form of a volume image. 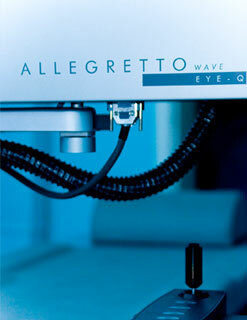 It is possible to obtain profiles with accuracy until 300 microns in depth with any retinal cutting during processing. The leading clinicians of the world are choosing Retinotomograph Heidelberg Engineering HRT III, when a precise and reproducible three dimensional analysis of retinal topography is necessary. This equipment is chosen for the basic performance of long-term clinical comparative investigations in glaucoma, as well as investigation of the administered treatment efficacy, that are performed simultaneously in several clinics within a common international programme. Typical use of the Retinotomograph Heidelberg Engineering – it is topography of the optical nerve, necessary for early glaucoma, early retinal degeneration and initial stage neoplasm diagnostics. 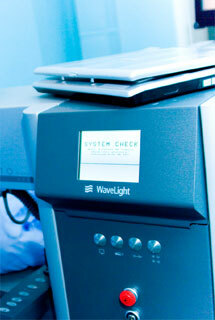 The system includes a developed mathematical data base analysis programme, data base management and result printing. HRT III enables independent measurement of fundus oculi topography height in 65000 points in retina in the field of 10x10, 15x15 or 20x20 grades. Accuracy and reproducibility of these measurements are proven in multiple investigations. Measurement result processing is performed very quickly (in 1,5 sec), and the built-in system of automatic management follows the image quality and interaction of ophthalmologist is not necessary. It is very important to point out, that there is a system for change detection in retina after the previous investigation. In addition, a special programme evaluates itself significance of these changes and analyses them.